That’s the good side of this single. On the other hand, consider that date: this is a very close copy of a song that’s five years old, and it still sounds as modern as any R&B track a British boyband has given us. R&B was an obvious direction for boybands, but one where the Brits apparently had either no ideas or no conviction in them. British pop has often fallen back on copying American hits, but even in the 50s there wasn’t this much of a time lag. The levels of thought or craft that went into Billie or B*Witched’s hits are nowhere here – probably nobody had a concept beyond taking a proven single and putting four fit lads in front of it. There’s a double danger in that approach: the band won’t be up to the job, or their hearts won’t be in it. On this evidence, both might be true of Another Level. Listen to Silk’s go at “tonight baby – I’m gonna get freaky with you”. You might say it’s overdone, but there’s a thirst in it which Bowers can’t or won’t match: the song works better when its singers are happy to go over the top. Bobak does better on the verses, but their poker-faced patter was the weak spot of the Silk version in any case. The video cuts repeatedly between our pouting heroes at some grimy warehouse party and shots of pit bulls and coal miners – a weird pick’n’mix of masculinity that manages to make them look even more uncomfortable. The sad and telling thing is that in the 90s Another Level were the most sustained British attempt at an R&B boyband – backed enough to get a Jay-Z guest verse on a remix of their first single, a sign of the type of audience they were aiming for. To have slipped back into awkward covers territory so quickly shows just how far the business – and maybe the band – were out of their depth when it came to this music. #30: Also DAMAGE! I can cheerfully admit to remembering 0 of their songs but they were definitely clean cut enough to be invited on Live and Kicking several times. #32 Ah yes, Damage! I watched all of the Big Reunion 2 earlier this year, which prominently featured them (as well as Dane Bowers), yet still they slipped my mind. I don’t remember much more than their cover of Wonderful Tonight from the first time round. Holy crap, I’m glad that one passed me by! MN8 must have been a reasonably convincing UK R&B outfit as, until just now, I always assumed they were American. #28: I can confirm that, at the age of sixteen, everyone was at it except me. Meanwhile, how were the boys managing in the midst of all this girl potency? Despite Another Level routinely being considered and remembered as a boy band, and the subsequent, slightly comedic figure of Dane Bowers, they considered themselves a credible Brit R&B group, so much so that Bowers committed the cardinal boy band sin of having a son and expressing fulsome pride about him. Indeed their two-year run of hits included cameo appearances by guests of the calibre of Ghostface Killah and Jay-Z, even if that had more to do with useful record label/management tie-ins. 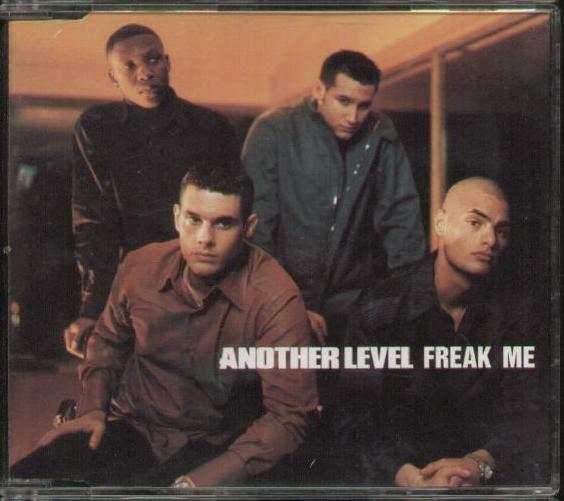 “Freak Me” was their second and biggest hit, and more or less a straight cover of the five-year-old American R&B smash for Keith Sweat proteges Silk; although their harmonies are fine and compatible and the record is lent a pleasing marooned spacecraft aura of minimalist echoes by mixers Cutmaster and Joe (now on their third number one of mixing duties), there is no great individual character in each of their voices, the song does not seem to develop in any significant direction (i.e. progress to another level) or even stand still particularly interestingly, and one’s liking for it will heavily depend upon one’s tolerance for tropes such as “Let me lick you up and down” and “Let me play with your body baby” which make this listener nostalgic for the unspoken Hays Code, even in the Isaac Hayes/Barry White era (or for that matter in the parallel D’Angelo era), where sexuality had to be suggested rather than spelled out in big, pulsating, purple capital letters. Also, *cough* this is 1998 not 1995! #28: definitely not at it at 16 (or 17, or a few more numbers after that). Chance’d have been a fine thing. There were distant rumours at 16 that others might have been at it. I frowned and turned up the volume on my John Peel Festive Fifty tapes. Can’t believe I missed the year for this long – thanks! I definitely wasn’t at it at 16, but the teachers were – two of them were having an affair that even made it into the News Of The World. (They were both married – to other people – and both had kids at the school at the time. It didn’t end well for anybody, least of all the kids.) There were also a couple of (unsubstantiated) rumours involving teachers and pupils… fraternising in the classrooms. Can’t believe we are still several years away from the apex of this fairly grim tradition of Boy Band quasi-hardness-filth, Too Close by Blue. It’s incredibly gross, and the perfect Lambrini and glitter sing-along song among me and my friends. I was totally out of the loop with this song in ’93, when Slik topped the charts with it. That year I only was aware of Boyz II Men, Shai, and Tony! Toni! Tone! (oh what a name) as far as R&B went. And when I thought I knew this song, I was really thinking of its little brother “Freakin You” by Jodeci (nearly peed my pants laughing at the lyrics). This one, meh…doesn’t even have that. Like a more scrubbed up East 17 but reaching for an R ‘n’ B vibe that’s beyond them.Taking its cues from post-Mac Mark Morrison. I didn’t find it that bad in 98 .Compared to what was at Number 1 before it was a bit more ‘now’ compared to the slightly retro ‘Three Lions’ and bubblegum Billie but now it sounds a bit thin and dated. They were not the worst of the boy bands but hardly the finest either.